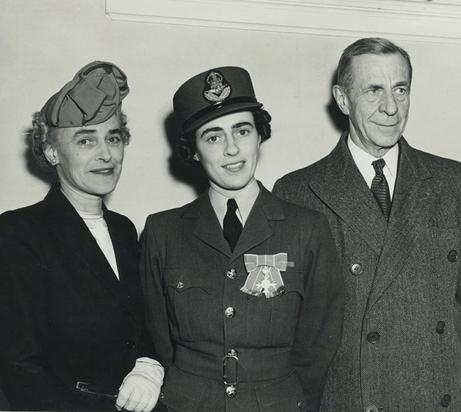 Willa Magee Walker rose rapidly through the ranks in 1941 to become head of the newly-formed Royal Canadian Air Force Women’s Division. Only 28 years old, grieving the recent death of her baby son, her husband locked away in a German prison camp, Willa rose to the challenge with courage and dignity, breaking down barriers for future generations of women in uniform. I attended Carleton University with Willa Walker’s son Julian Walker, who now lives in the family home town of Saint Andrews, New Brunswick. Together we took the one-year program that led to a Bachelor of Journalism (Honours) in 1976. Back then, Julian was too modest to mention his parents (or perhaps we were too absorbed in our studies), so it wasn’t until 2016, when we were chatting at our forty-year class reunion, that I discovered Julian’s mother was the wonderful Willa Walker! Two years later, Julian invited me to the dedication of an Ottawa park, named in honour of his mother, on June 16, 2018 – but coincidentally, that was the exact date of my own mother’s memorial service in Battleford, Saskatchewan. I know that Julian and I were remembering our beloved mothers on the same day. But I did very much want to write about Willa Walker, who has not received the recognition she deserves! So with the help of Julian, who sent me photos and a sheaf of wartime newspaper clippings, I compiled a brief biography of this remarkable woman. I have only touched on her many achievements here. Her family plans to write a book about Willa’s life, and I will be the first in line for a copy! Wilhelmina Magee was born in Montreal on April 3, 1913, one of four children of bank president Allan Magee and the former Madeline Smith of Saint John, New Brunswick. The Magees lived in Montreal, but the children enjoyed spending summers at the Smith family's rental cottage in Saint Andrews, New Brunswick. Willa, as she preferred to be called, received an excellent education at a private school for girls called The Study, and developed a keen social conscience. She was an early backer of the famous Canadian doctor, Norman Bethune, who became a giant figure in the Chinese civil war. 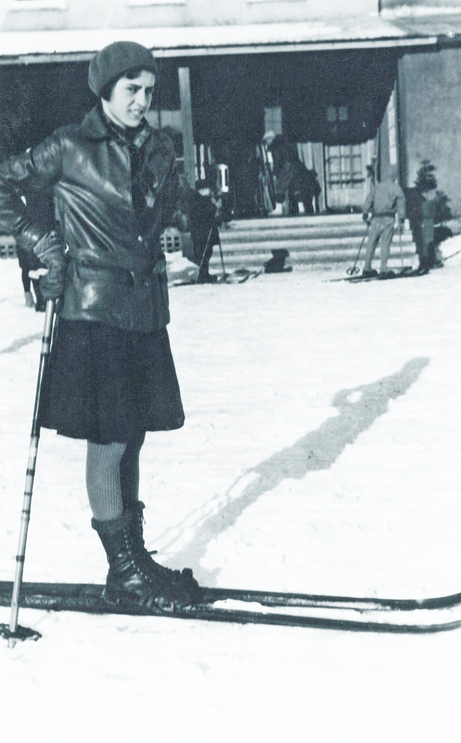 This photo shows seventeen-year-old Willa at Saint-Sauveur. After finishing school, Willa travelled to Paris to study French language and culture. 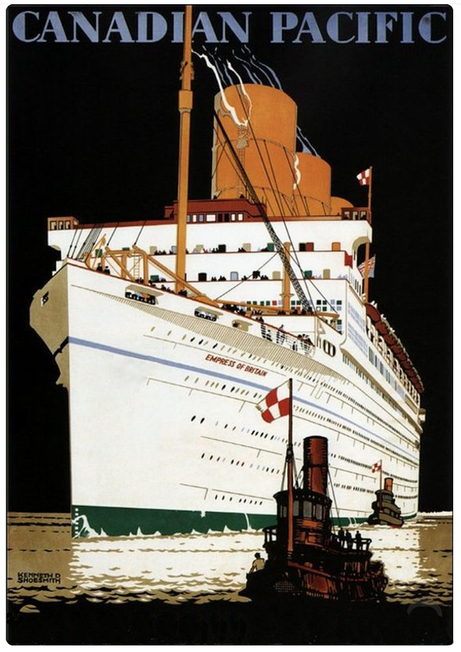 Upon her return to Canada in 1933, when she was still only 20 years old, this plucky young woman worked her way around the world as postmistress on Canada Pacific’s famous Empress of Britain ocean liner, shown on this travel poster. Back in Montreal, Willa was employed by a news agency, accompanying the photographers who took pictures of local debutantes and celebrities. Hearing that Sir Herbert Marler had been appointed as Canadian minister to Washington, D.C., Willa offered herself as social secretary to his wife Lady Beatrice Marler, and spent the next two years in Washington with the Marlers before returning to Canada. 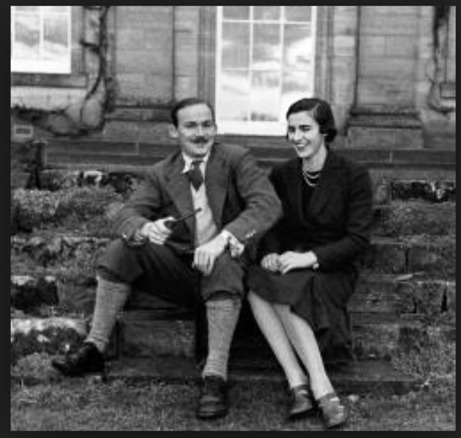 In 1939, Willa was invited to a party at Rideau Hall in Ottawa, residence of the Canadian Governor-General, and there she met a young Scottish captain in the British Black Watch 51st Highland Division, named David Walker. David was serving as aide-de-camp to Governor-General Lord Tweedsmuir, the novelist John Buchan. The couple's first meeting was far from promising -- Willa asked David for a sherry, but he brought her a stiff Scotch instead! However, sparks flew between the attractive young couple, and after a whirlwind courtship, they married on July 27, 1939. Only a few days after their honeymoon in David’s native Scotland, war was declared and he rejoined his division. This photo shows a happy David and Willa on their honeymoon. 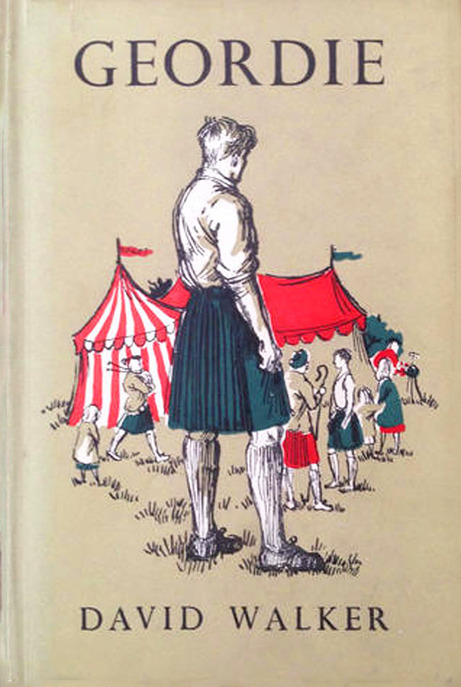 When David went to war with his regiment in France in 1940, Willa stayed with David’s parents at their home in Cupar, south of Dundee, not far from Saint Andrews in Scotland. Shortly before the evacuation of Allied troops at Dunkirk in June 1940, David's entire division was captured at Saint-Valery in Normandy. David spent the next five years in a prison camp. He managed to escape three times, but was always recaptured. Eventually, he was sent to the infamous Colditz Castle in Germany, a fortress for incorrigible inmates who had repeatedly escaped from other camps. It wasn’t until after his capture that Willa discovered she was pregnant. She returned to Canada for the birth of her son Patrick in November 1940, but tragically, he died of crib death in February 1941 at the age of three months. His loss was a lifelong sorrow for Willa, and David never saw his young son. With her baby gone and her husband in prison, Willa decided to join the war effort herself. In October 1941 she graduated with the first group of air force recruits, and achieved the highest marks in officer training. Three months later, in January 1942, she was placed in charge of the new female recruits in Canada, all of whom entered Number 7 Manning Depot in Rockcliffe, Ontario, for basic training. 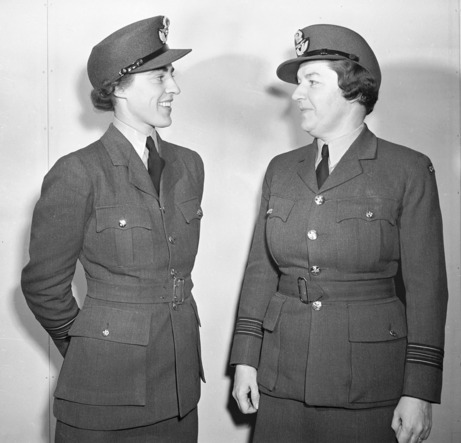 In February 1943 Willa was promoted to commanding officer of the Women's Division in Canada. In doing so, she replaced Kathleen Oonah Walker (no relation), another esteemed female officer who departed for England to become head of the Women’s Division overseas. This photo shows the two Walker women, Willa Walker on the left and Kathleen Walker on the right, in March 1943. (Photo credit: Department of National Defence). Willa was a natural-born leader. She was responsible not only for setting up training depots all over Canada, but for the overall discipline and efficiency of the Women’s Division. It was also her duty to urge more women to enlist, and no doubt her enthusiasm convinced many young women to follow in her footsteps. 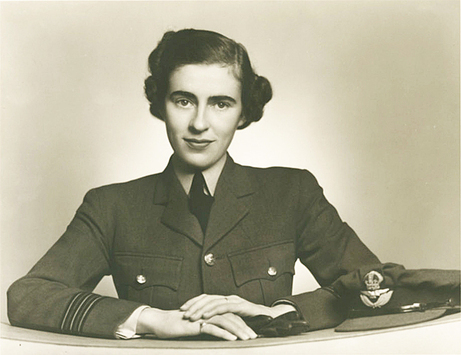 As commanding officer of all the airwomen in Canada, Willa’s portrait was taken by the famous Canadian photographer Yousuf Karsh. He took the formal photograph of her in uniform seated at her desk, the one that appears at the top of this page. At the same time, he also took this less formal portrait of Willa in a tweed jacket. This is the photograph that she sent to David in prison, and one that he cherished during his long years of captivity. 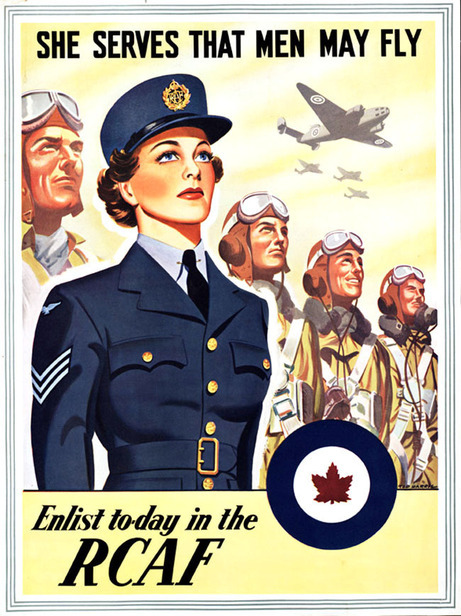 At the time, many Canadians believed that women didn’t belong in uniform, that they should tend the home fires instead – knitting socks, rolling bandages, and growing Victory gardens. They feared that a woman’s reputation would suffer if she were away from her parents’ watchful eyes. It was Willa’s job to persuade them otherwise. For the next couple of years she criss-crossed the country by land and air, speaking to groups and organizations, even church congregations, in an effort to change the public perception of women in uniform. Recruiting posters like this one were seen everywhere. 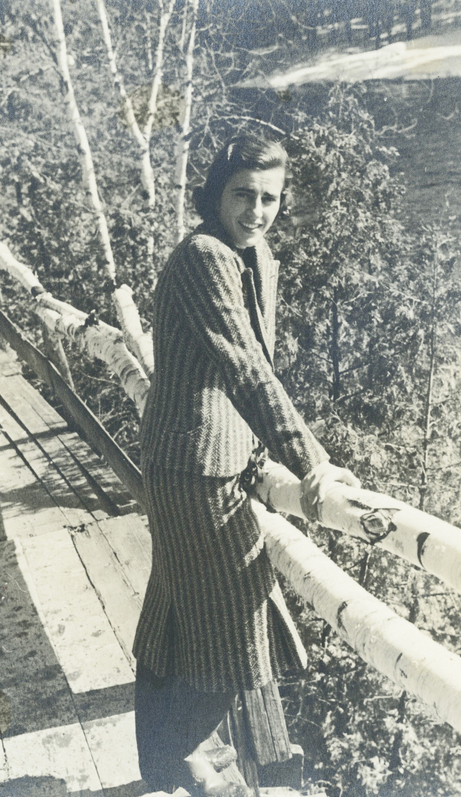 In May 1943 Willa undertook an exhaustive trip across Western Canada, visiting 33 air bases between Winnipeg and Vancouver Island in five weeks, recruiting young women and meeting as many of their parents as possible. "You would consider it the right thing for your sons to do, and you should also feel that it is the only right course for your daughters," she urged. One of her most persuasive arguments was that air force life was good training for future homemakers! Most women, she explained, join the services for intensely patriotic reasons. Some have lost husbands or fathers or brothers, and are determined to take their places. “They aren’t looking for glamour,” she said. “They want it to be hard. They want to experience to some extent the life that their relatives had.” (It sounds as if Willa might have been speaking from her own heart). On this tour, Willa was accompanied by another reputable officer, Jean Flatt Davey, the first female doctor in its Medical Division. Women in the air force were healthier than average, the two women explained, because they received good food, plenty of exercise, and excellent medical care. This group photo shows Jean Davey, third from left; and Willa Walker, centre. 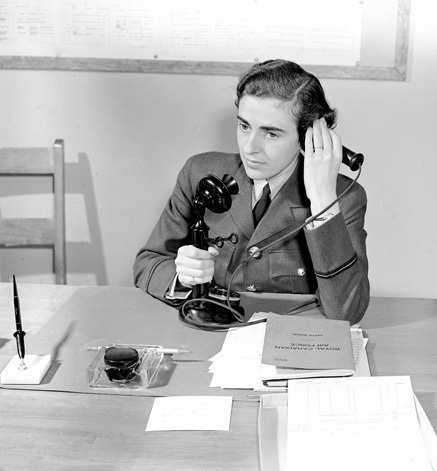 Willa also emphasized the training that women received in forty different trades, including meteorologists, mechanics, wireless operators, and operational clerks. And although the women received only two-thirds as much pay as the men, female veterans would receive the same benefits after the war as male veterans, including pensions and the opportunity for further education. 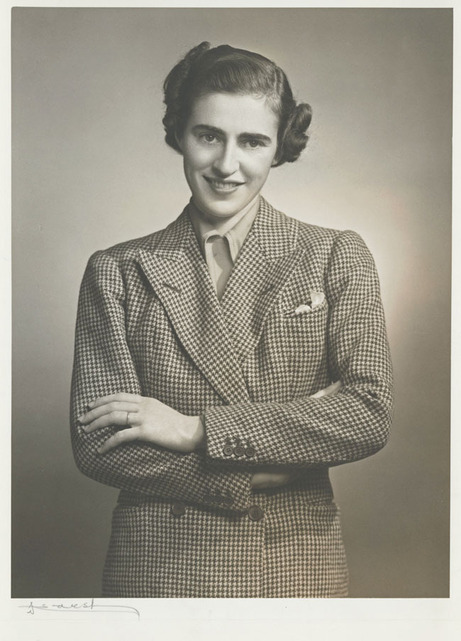 Willa was asked repeatedly by eager young recruits across the country when women would be sent overseas, but she was quick to point out that they were badly needed here on Canadian air bases. (Only about 2,000 of the 17,000 women in the air force were fortunate enough to be sent overseas in wartime, and I have interviewed two of them. Read their stories here: Nancy Lee Tegart, and Eugenie Francoeur Turner). Willa went on to visit all the air bases in Eastern Command, and even travelled to the Dominion of Newfoundland, at that time a separate country. Here she is seated at her desk, using a telephone that looks very old-fashioned today. Also seen on her desk is a fountain pen and an inkwell. Willa is wearing her plain gold wedding band on her left hand, and a signet ring on her right hand. 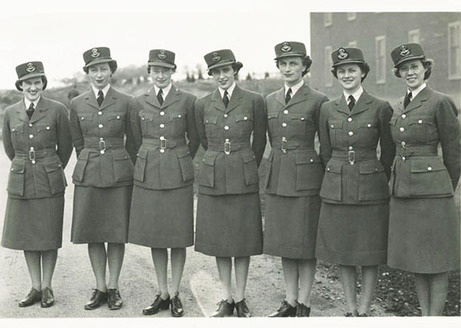 Airwomen were restricted as to the number and items of jewellery they were allowed to wear while in uniform. (Photo credit: Department of National Defence). It was still very much a man's world, but privately, Willa waged a war for women’s equality. For example, at all the training depots, the officers' mess, or dining hall, was reserved for men only, so Willa was not allowed to eat with the male officers. Frustrated by this regulation, one day Willa ordered her driver to park in front of the officers' mess. In sub-zero temperatures, she sat inside the vehicle during a snowstorm, eating her cold crackers, until the male officers were so ashamed that they invited her inside. Across the country, women officers let out a cheer, as they were never again prevented from entering the officers’ mess! “The thing that has impressed me is their enthusiasm – their cheerful, keen attitude to do the job they are doing. People still don’t realize just how colossal it is,” said Air Chief Commandant Katherine Trefusis Forbes. In November 1943, Willa accepted a solid gold cup on behalf of the Women’s Division, a gift from the British Women’s Auxiliary Air Force, presented by Her Royal Highness Princess Alice, Duchess of Gloucester. 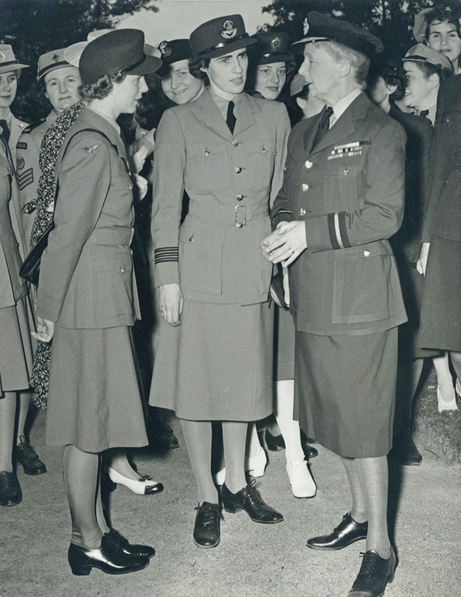 This photo shows Willa, centre, chatting with Princess Alice on the right, the Honorary Air Commandant of the Women’s Auxiliary Air Force, at a garden party at Government House in Ottawa in 1943. For her war work, Willa was made a Member of the Order of the British Empire in London, England, in January 1944, presented by Queen Elizabeth, the Queen Mother. This photo shows Willa wearing her decoration, flanked by her proud parents Madeline and Lieutenant-Colonel Allan Magee. During the long years that David was in prison, Willa never gave up hope that he might escape. She came up with a code for communicating important news in seemingly innocent letters to her husband, which passed undetected by both the Canadian and German censors. She also managed to smuggle escape maps to David in the soles of a pair of shoes contained in a Red Cross package. This time, Canadian military officers intercepted the package and found the maps. At first, they admonished her for her foolhardiness -- but the ingeniousness of the scheme appealed to them, so they repacked the shoes and sent off the package. Unfortunately nobody escaped from Colditz Castle, not even David. While in prison, David wrote extensively and sent some of his poetry to Willa. This was her favourite, a beautiful testament to their enduring bond. Sweeps in the trees and the owls call. As the end of the war approached, women were no longer needed in the armed forces, and they began to receive their discharges. Willa resigned her post in October 1944 after three years of service, to await the return of her husband. It wasn’t until May 1945 that the war finally ended and they were reunited. (Note: After the war, it was announced that there would be no Women’s Division in the permanent air force. Six years later, in 1951, the air force began accepting women into its regular ranks. Currently 19 percent of serving air force members are female). The couple settled briefly in Scotland, where their son Giles was born. The young family then travelled to India, where David served as chief of staff to Lord Archibald Wavell and, subsequently, to Lord Louis Mountbatten. The final years of British rule in India were marked by tremendous bloodshed and turmoil. After Willa witnessed street demonstrations in support of Mahatma Gandhi, she became a great believer in his non-violent campaign for Indian self-rule, which was finally achieved in 1947. That year, the Walkers returned to Scotland, where David retired with the rank of Major, and their son Barclay was born. 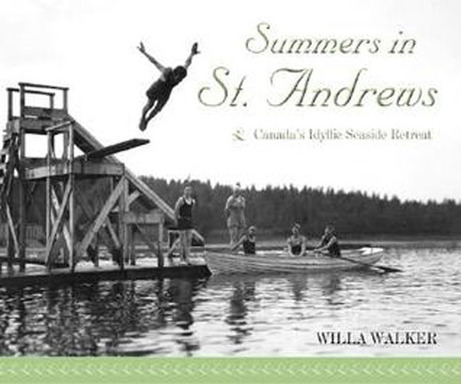 The following year, the Walkers returned to Canada and settled in Saint Andrews, New Brunswick, a lovely seaside town on the south coast where Willa had spent many happy summers as a child. There two more sons were born, David and Julian. This 1961 photo was taken on holidays in Champéry, Switzerland. Willa brought her organizational skills to bear on the challenge of raising four rambunctious boys. Julian recalls that his mother loved occasions when she could meet new people and make lifelong friends. “She believed that events such as parties should be for all ages, and she was never slow to roll out the carpet for dancing. She especially enjoyed welcoming new immigrants to the town, and delighted in them becoming citizens. “We were fortunate to have a hockey pond in our back yard, and our mother was a special Hockey Mum. She would be at the post office in Saint Andrews first thing on Saturdays to pick up as many kids as wanted to play hockey. While Willa was mustering the troops, David Walker was pursuing his dream of becoming a writer. He succeeded in establishing himself as a novelist and wrote 21 books in total. 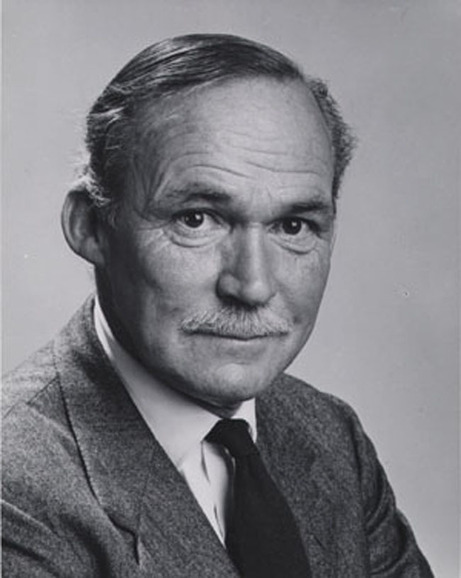 David Walker twice received the Governor-General’s Award in Canada for Literary Merit, for his 1952 novel about a prisoner-of-war camp titled The Pillar, and for his novel Digby in 1953. 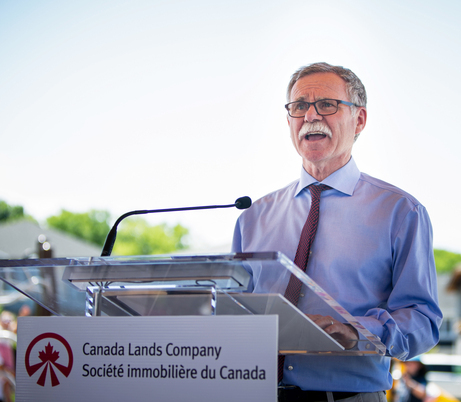 As well as being an accomplished writer, David was an ardent conservationist, and one of the founding members of the Conservation Council of New Brunswick. He was made a Member of the Order of Canada in 1987. After his death from congestive heart failure in 1992, the Walker family established the David H. Walker Prize in Creative Writing at the University of New Brunswick in his memory. Willa, too, was dedicated to serving the community. 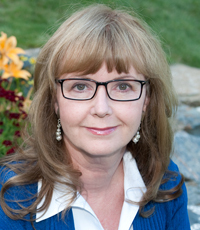 She belonged to many local organizations, and wrote a popular book about her beloved town titled Summers in Saint Andrews: Canada's Idyllic Seaside Retreat, available on Amazon. Willa Magee Walker died in 2010 at the age of 97. The home where she raised her family was the scene of many happy family reunions. 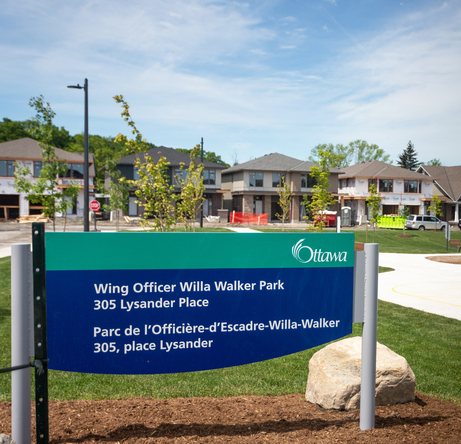 On June 16, 2018, this park in Rockcliffe, Ontario was named and dedicated in her honour. If you live in the area, or you are visiting Ottawa, please drop by this park and spend a few moments reflecting on Willa Walker's courage and dedication to her country. Her sons Julian and Giles attended the ceremony, along with a number of Willa’s grandchildren and great-grandchildren. Here is my friend and classmate Julian Walker, addressing the crowd. (Both photos were provided courtesy of Canada Lands). Willa Magee Walker, thank you from the bottom of my heart for your service to your country, your community, and your family. You truly embodied the Royal Canadian Air Force motto, Per Ardua Ad Astra -- Through Adversity to the Stars. Rest in peace. Last year, I pitched this idea to my local Royal Canadian Legion Branch 71 here in Invermere, British Columbia, and they sponsored the Honour Our Veterans banner program, which is spreading to communities across Canada. Banners are sponsored by each veteran's family and hung on our town's main street for six weeks, from October through Remembrance Day. Last year we started the program with 72 banners, and this year an additional 24 banners were added. And there's a waiting list for next year already! This is my Dad's banner -- isn't it lovely? This photo shows my daughter Katie, who lives right here in Invermere, and her three young children, standing underneath her grandfather's banner. It's a great way to teach young people about the sacrifices made their family members yesterday, in order that they might live in freedom today. I wrote a How-To Guide for anyone who wants to launch the banner program in their own community, and you can read all about it by clicking here: Honour Our Veterans. I'm running a little contest on Facebook for a signed book giveaway. If you send me a photo of yourself reading Wildwood before midnight on November 30, 2018, I will enter your name in a draw for a free signed book that I will mail to you or anyone you choose. Email your photo to me at elinor1@telus.net. 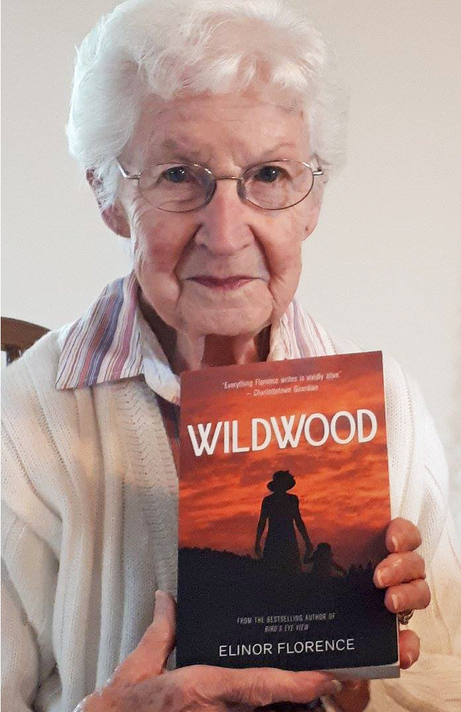 The below photo shows Betty Florence of Cold Lake, Alberta (she's a distant relative and we have never met, but she looks like a lovely person) reading Wildwood on her eighty-eighth birthday. I have just one event left in 2018, and that is the Christmas Craft Sale here in Invermere. I'll be signing copies of all three of my books at the new Columbia Valley Centre, from 4-8 p.m. November 30, and from 10 a.m. to 4 p.m. on December 1. 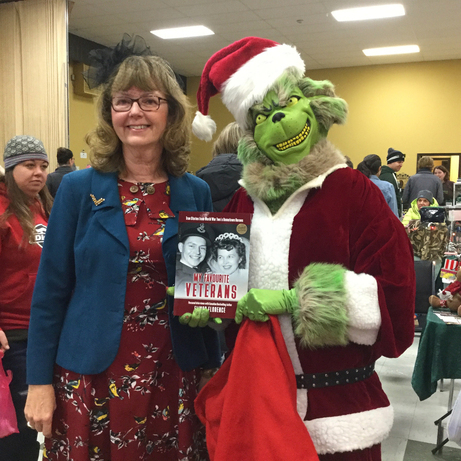 The last time I attended the Christmas Craft Sale, I had a visit from the Grinch himself! Signed books make great Christmas gifts, and I'll be happy to mail your copy straight to you, or to the recipient. You can pay me by cheque or credit card. Email elinor1@telus.net for details. Below you will see the covers of all three of my books. Bird's Eye View and Wildwood can also be ordered through any bookstore, or online at Chapters or Amazon. 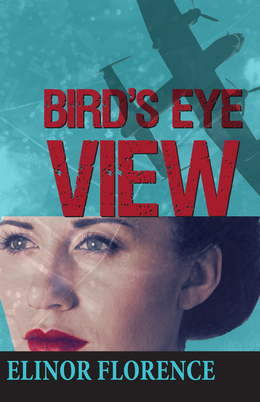 Both are available as e-books, and Bird's Eye View is also an audiobook. My Favourite Veterans is only available from me. 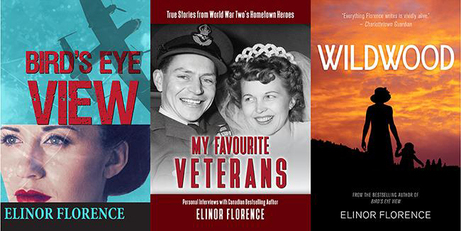 For more information on any of these books, click on the title: Bird's Eye View, My Favourite Veterans, or Wildwood. Dear friends, I hope you had a peaceful Remembrance Day and you are ready to enjoy the Christmas season. A very special welcome to all my new blog subscribers, and a special thanks to all my "old" blog subscribers. Don't forget to stay in touch, as I love to hear from you! You can find all my contact information by clicking here: Contact. You may also follow me on Facebook, read my book reviews on Goodreads, and see my photos on Instagram.